The concept of corporate social responsibility (CSR) is a relatively recent addition to the agenda in Germany, although the country has a long history of companies practicing social responsibilities. The expectations of society had remained stable for many years, encapsulated in laws, societal norms, and industrial relations agreements. But the past decade has seen significant changes in Germany, challenging established ways of treating the role of business in society. 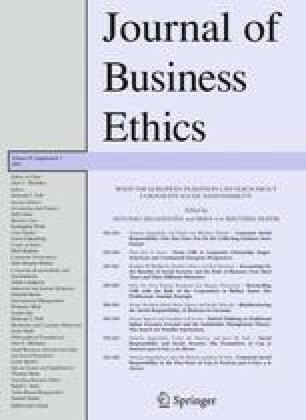 This contribution reviews and illustrates the development of diverse forms of social responsibility in German corporations and analyzes how actors in business and society can build on traditional strengths to find new institutional arrangements for sharing tasks and responsibilities in the interests of achieving a better balance between societal, economic, and environmental needs. Bundesregierung: 2002, Stellungnahme zum Grünbuch der Kommission “Europäische Rahmenbedingungen für die soziale Verantwortung der Unternehmen” KOM (2001), 366 ENDG [The Position of the Federal Republic of Germany on the CSR-Greenbook of the EU Commission], http://ec.europa.eu/employment_social/soc-dial/csr/pdf2/013-GOVNAT_Deutschland_Germany_020131_de.pdf. Accessed Aug 2006. Gebauer, J. and U. Westermann: 2007, Nachhaltigkeitsberichterstattung in Deutschland. Ergebnisse und Trends im Ranking 2007 [Sustainability Reporting in Gemany. Results and Trends in the 2007 Ranking] (Institut für ökologische Wirtschaftsforschung und Future e.V. Berlin, Hannover), http://www.ranking-nachhaltigkeitsberichte.de/pdf/2007/Ergebnisbericht_Ranking_2007_final.pdf. Accessed Dec 2008. Loew, T., J. Clausen and U. Westermann: 2005, Nachhaltigkeitsberichterstattung in Deutschland. Ergebnisse und Trends im Ranking 2005 [Sustainability Reporting in Germany. Results and Trends in the 2005 Ranking] (Institut für ökologische Wirtschaftsforschung und Future e.V. Berlin, Hannover), http://www.ranking-nachhaltigkeitsberichte.de/pdf/Ranking_Endbericht.pdf. Accessed Dec 2008. Rat für Nachhaltige Entwicklung: 2006, Unternehmerische Verantwortung in einer globalisierten Welt – Ein deutsches Profil der Corporate Social Responsibility. Empfehlungen des Rates für Nachhaltige Entwicklung [Corporate Responsibility in a Globalised World – A German Profile of Corporate Social Responsibility. Recommendations of the German Council for Sustainable Development] (Berlin), http://www.nachhaltigkeitsrat.de/uploads/media/Broschuere_CSR-Empfehlungen.pdf. Accessed Dec 2008.